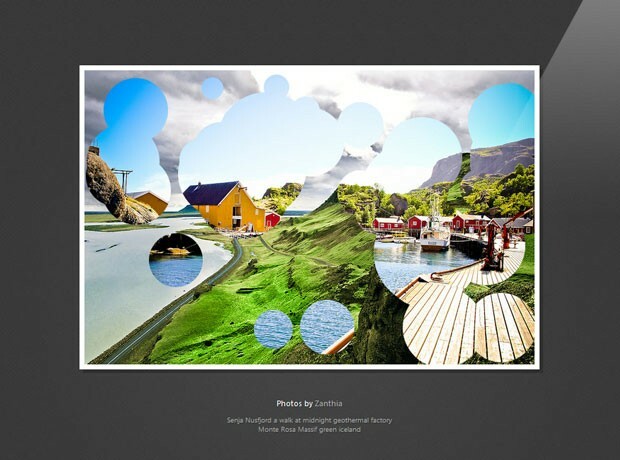 The slideshow effect we will be creating today, will take the form of an easy to use jQuery plugin. As most of the work is done by the plugin, there isn't much to do in this section. However, to use the plugin you need to add an unordered list on your page. The individual slides of the slideshow will be added as LI elements. To be able to use the plugin, you will need to include jquery.bubbleSlideshow.css in the head of the page, bgpos.js and jquery.bubbleSlideshow.js before the closing body tag. bgpos.js is a jQuery CSS hooks plugin that will allow us to animate the background-position property (needed in the bubble animation), and jquery.bubbleSlideshow.js holds the code we will be writing today. Also remember to include the jQuery library as well. 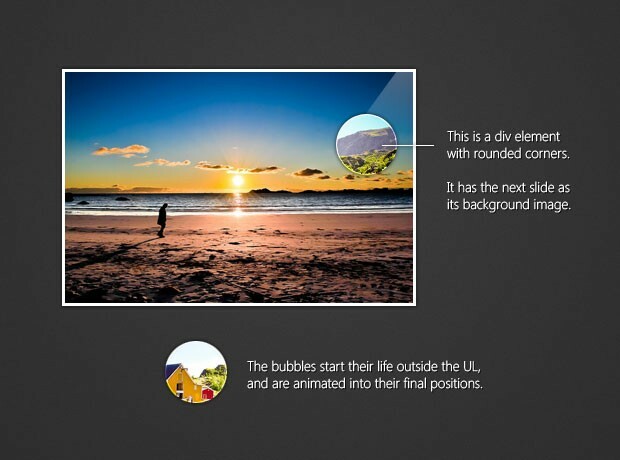 You can see a simple explanation of the bubble effect below. // and a callback function, executed when the animation finishes. The flyFrom() method takes a set of coordinates, that determine the position the bubble flies in from. It still ends up in the position that you specify when creating it. This method is defined on the Bubble function's prototype, which automatically makes it available to all its instances. This is a more effective approach, as only one copy of this method exists at a time, instead of a copy of this method for each object. Also, notice the rand() function defined at the bottom of the fragment. It mimics the PHP function of the same name and is used throughout the plugin code. As you guessed, for every slide transition, a new random set of bubbles is created, and destroyed after the next slide is made visible. // and uses it to hold and animate the bubbles. // finish and removing the li. The code above defines a new plugin called bubbleSlideshow(). It should be called on a UL element and takes an array of photo URLs as its parameter. These are added to the UL. // Using the showBubbles function, defined below. // The frame is showed after the bubble animation is over. // This returns a jQuery Promise object. I used "local" to describe these functions, because they are not available from outside the plugin. The showNext and showPrev functions above both call showFrame, passing it the UL and the LI slide that is to be shown. showFrame makes sure that there is only one animation running at a time, and calls the showBubbles function we already wrote. The callback function that is passed along with the method call, displays the slide you want to show above all the others by appending it last in the UL (the slides are absolutely positioned, which means that the last element in the UL is shown on top). This function is called once the bubble animation completes. With this the bubble effect slideshow is complete! The effect we made today may not be limited only to slideshows. It can be used to build unique website backgrounds, headers and presentations. The plugin is built to automatically resize to fit the UL, so you can easily change its size by tweaking a few CSS properties. Thank you so much for this tutorial! I really learned some new great tricks. I love your tutorials and your clean layouts. But the effects are veeery good! Pretty Nice Plugin. But I can not make it in IE6. Why would you need IE6 compatibility. Didn't we all attend its funeral over a year ago? It's Very Great...If I have folder 'Image' that contain many image...how I Slide show my image from folder 'Image' ? how to replace the image ? ?